April is EAT LOCAL Month! 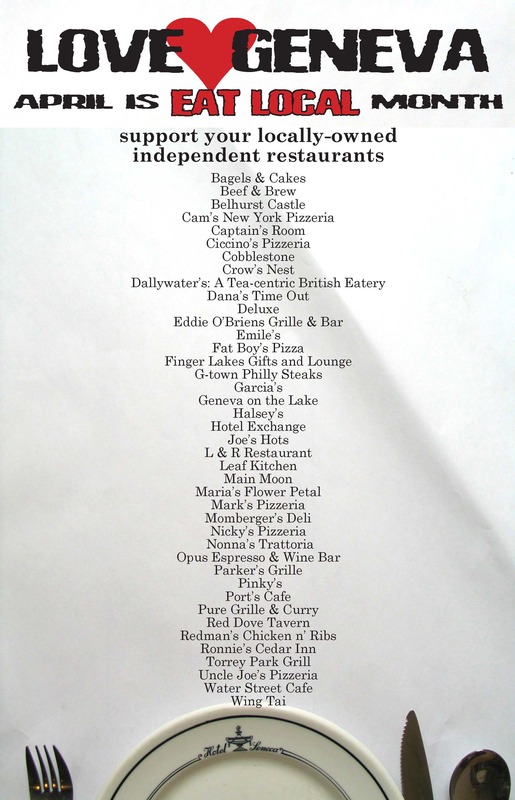 One of Geneva’s greatest attributes is the high number of quality independent, locally-owned restaurants located here. During our LOVE GENEVA campaign, we have struggled to find a way to best incorporate them into our cash mob campaigns. The reality is that cash mobs don’t work well for restaurants — if a large crowd shows up, those who have to wait for tables inevitably get frustrated and the whole event becomes counter-productive. But independent, locally-owned restaurants are one of the backbones of our local economy. They provide valuable direct employment to many people, they are an important source of tax revenue, they draw outsiders to our community — who then shop in other Geneva stores, and they often support local and regional farmers, as well as other locally-owned businesses (from accountants and lawyers to carpenters and electricians). And they give back to the community in numerous ways — including donating food to the needy and supporting various fundraisers for community projects. So we’ve decided to declare April EAT LOCAL month, complete with a poster campaign. Please patronize independent, locally-owned restaurants as often as possible during April. Encourage your friends and co-workers to dine local. Many of you probably already patronize your favorite local restaurant, but consider expanding your horizons and dine at a locally-owned establishment on the list that you have never tried before! * We are making an important distinction between locally-owned independent restaurants and larger regional or national chains that might be locally franchised. While we appreciate the value of national/regional franchises, evidence shows that locally-owned independent establishments provide greater resources and direct support for local economies. We’ve tried to be exhaustive in our list of locally-owned independent restaurants, but we may have accidentally excluded some. If that is the case, we apologize and would like to know of our mistake so that we can correct it in future campaigns. As always, thank you for your support! Skin care for men and women, massage, manicures/pedicures, and laser hair removal are just a few of the many services offered by Shari’s Derma Technologies on Seneca St. Shari has recently expanded and added The Chic Boutique featuring MADE IN AMERICA clothing and accessories for all shapes and sizes. Shari’s also offers healthy products for your skin such as custom blended mineral makeup, washes, masks, exfoliants, and creams. The staff at Shari’s has a unique talent for making clients feel truly special. Let’s show these ladies how special we think THEY are with our support on Saturday, March 9th. What is a CASH MOB? When a group of people assemble at a local business and buy items to support that business and the overall community.